Whatever business you’re in, we’re absolutely certain of one thing – you don’t get out of bed every day to just break even. Making a healthy profit, turning that profit into cash will ultimately provide you with the building blocks to create wealth and enjoy more freedom with your family, friends and life. So often small and medium businesses aren’t making the profits they want to or they’re capable of. In reality, growing businesses are resource hungry and we’ve all heard the dangers of “growing too fast”. Once those expenses get out of hand, profit margins dwindle and your business becomes an overwhelming place to be. It doesn’t need to be that way. There are ways to improve your profit and build the life and business you dream about. Assuming you’re not a pilot, if you jumped into the cockpit of a helicopter and had to fly it chances are you’d probably crash. Not to be grim or anything but there are levers, throttles, sticks and pedals and quite honestly I don’t know how pilots learn and get to grips with all of that! Luckily profit is a little simpler and there are seven levers that you can pull to make an impact on your overall profit. In reality, Profit = Sales – Expenses. Right? You’re probably thinking that the only way to improve profit is to either increase your sales or reduce your expenses. You’d be right but there’s more to it than that. 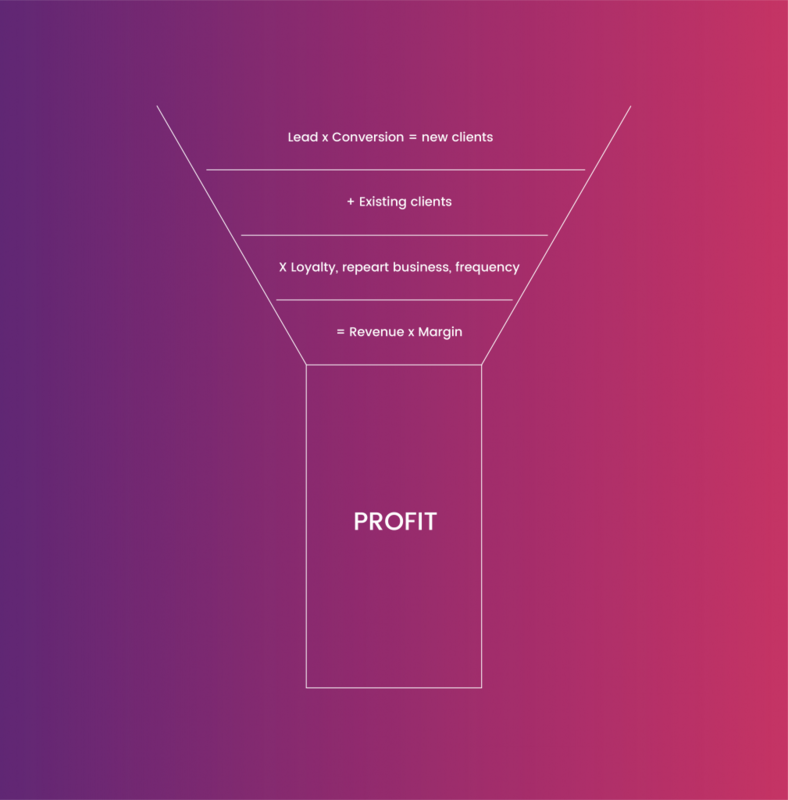 Let’s look at our profit funnel here and talk about the quality of what goes in. We can increase our leads, that’s one way of increasing revenue. It’s also expensive to acquire new leads so it shouldn’t be the sole focus – you have other levers to pull and adjusting seven levers a little bit has a compound effect. What about conversion rates? It costs a fortune to go out there and get new leads so are you making sure that your conversion rate is the best it can be and it’s optimised as much as possible? We don’t suggest that you have a 100% conversion rate – this can be a tell-tale sign that you’re too cheap or there’s another issue within the sales process. What about existing clients. One of the most underestimated levers you have at an arm’s reach. Existing clients are a source of revenue, referrals and it’s vital to look at your order book, assess customer/client loyalty, how often do customers buy from you and whether or not you can upsell or cross-sell other products and services. Margin. Here’s a little monster hiding under the bed! Often small businesses have such a fear of losing a sale they will squeeze their own margins until there’s nothing left. It’s a common trap but if you have your ideal customer, you’re doing your best work or selling a product you believe in don’t let that margin become a monster. So really, there’s far more to improving your profit potential than meets the eye. If you improved each one of these by 1%, 2% or even 10% what would the overall impact on your profit be? It goes without saying that every business has its seasons. Whether that’s literal in terms of a highly seasonal product or offering or whether it’s figurative. How you run your business when the going is good is the only true predictor of how well your business will cope with a season of winter. Setting aside profit for future growth or for a season of winter is vital. There’s a temptation to spend and enjoy all the spoils when there’s been a good quarter or a good year. Make sure that you’re planning for reinvestment and growth, setting aside a percentage in a separate account. This way it can’t be eaten up by day to day operational costs. Growth is another way to power up your profits. What it costs to run each area of your business, having timely information and watching that closely against a benchmark (budget) is vital to success. When a business is growing unexpected expenses crop up and can be a huge downfall, expenses can also quickly get out of hand if they aren’t controlled carefully. When you’re busy managing staff, making sure you have happy customers, worrying about sales and everything else that comes with running a business, it’s not easy to get to grips with the numbers. A virtual FD can help swing the statistics in your favour and give you the knowledge, tools and resources you need to make your business successful. Give us a call or send us an email to have a chat about the things keeping you from fulfilling your profit potential.